While I have known about Gamma World for many years, I only got to play it for the first time today at the Gamma World Game Day. Basically, you go to your local participating game store, sit in on a game, and get to experience what Gamma World is all about. I took my 13-year-old son with me today, and we had a blast. Does Gamma World measure up to past editions? I can’t say either way, as I’m not familiar with those prior editions. 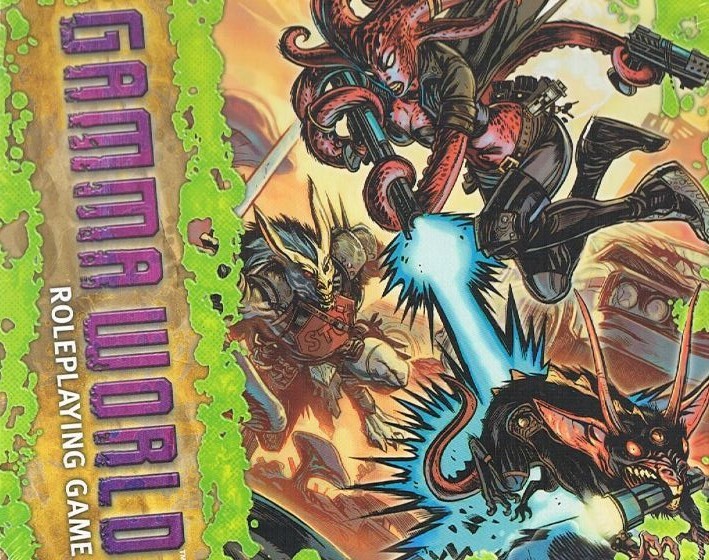 What I can comment on is this version of Gamma World. It’s a variant of the 4th edition Dungeons & Dragons rules that combines classic role-playing, a card game element, and incorporates tactical game play. The Gamma World boxed set claims to be, “A wacky, wily roleplaying game of post-apocalyptic peril.” On this, it delivers. Your character begins with two origins. Basically, you pair up two mutations to see what you can be. My son was a speedster doppelganger. I was a radioactive mind courser. Since radioactive characters can shoot radioactive beams from their eyes, I decided to take some X-Men inspiration and have only one eye. My character’s name? Psi-clops. My son got to make copies of himself, who could go into situations, attack bad guys, and keep my son’s character safe. Think Jamie Madrox, the Multiple Man, from the X-Men comics. The adventure, Trouble in Freesboro, had the party being hired as mercenaries to take out these bad guys who set up shop in town, and are creating some super-weapon. It consists of three encounters, with an optional third encounter. The first encounter was all combat. The second, though, went very differently than I thought would happen. I came in expecting a lot of combat. But in this encounter, a little fast-talking had us making friends with humanoid cockroaches who had a Mexican accent. This was more than an encounter. This was role-playing. We didn’t fight, and we convinced these guys that we were the new hires, sent to work with them. We worked our way up to the top, where we faced the final enemies – a group of porkers and other assorted mutants. The big boss-man was a toughie, but we dispatched of him. The game includes Alpha mutation cards, which function as Gamma World’s variant of encounter powers. It also has Omega tech, which functions as magic items. There’s a certain suspension of disbelief necessary to really get into these, but once you get into it, it’s fun. Gamma World assumes that random mutations happen, so that’s how you get your Alpha mutation cards. Then it’s assumed that the collision of realities (kind of the background to Gamma World) leads to Omega tech lying around. I should mention at this point that my son has only gamed a handful of times. For Gamma World, he says that character creation was hard, but once that was over, he was fine. He says he really enjoyed this game, more so than playing D&D. He told his mom that she should play, and he has asked me when we will play next. In my mind, that’s the sign of a successful game. For me, seeing this sort of positive reaction in my son is all I need to have me sold on the Gamma World game.